Many certified medical billing and coding professionals begin their careers by enrolling in an online associate in medical billing and coding program. The BLS projects the number of medical records and health information technician jobs to increase 13% from 2016 to 2026, making now a great time to launch a career in medical coding. Medical coding professionals play an important role in the healthcare industry; these professionals organize and manage health information data to ensure insurance companies, health providers, and patients have accurate medical records. After earning their associate in medical coding and billing online, graduates work in healthcare settings such as hospitals, medical clinics, and doctors' offices, where they ensure the quality, accuracy, and security of health-related data. Online medical billing and coding coursework prepares students to sit for certification exams, including nationally recognized credentials such as certified coding specialist and certified coding associate. Certified professionals with an online medical billing and coding degree secure positions such as medical records and health information technician, health information clerk, and coder. What can I do with an Online Associate in Medical Billing and Coding Degree and What Will I Learn? Hutchinson Community College ranks #1 on The 25 Best Online Associate in Medical Billing & Coding Programs! Offering an online health care coding specialist certificate, Kansas-based Hutchinson Community College represents a good fit for online learners who want to take medical coding classes online without completing a full degree. Comprised of 45 credits, students complete this program over the span of three semesters. In addition to standard foundational courses in the areas of pharmacology, human anatomy, and physiology, learners also investigate specialized topics that support future careers in medical coding. Some of these areas include CPT coding and health information processing. Distance learners also participate in an innovative coding lab where they use industry-level programs to work with specialized records. To qualify for graduation, certificate seekers must also complete a one-credit supervised practicum; however, this does not have to be undertaken at HCC. Instead, a distance learner typically finds an affiliated facility near their home. All courses are taught asynchronously, letting students complete all of their degree requirements while working and/or balancing other responsibilities. Out-of-state residents pay a slightly higher tuition than those who reside in Kansas, but this difference is small. To be considered for this online medical billing and coding degree, applicants must submit a completed application and provide their high school diploma or GED certificate. Admissions decisions focus on a student's unweighted GPA, while scholarship decisions use their weighted GPA. Hutchinson Community College is regionally accredited by the Higher Learning Commission (HLC). Dakota State University ranks #2 on The 25 Best Online Associate in Medical Billing & Coding Programs! Based in Madison, South Dakota, Dakota State University's online health care coding certificate prepares graduates to take the American Health Information Management Association's Certified Coding Associate examination if plan on entering the workforce directly. Alternatively, students who want to continue their education can complete an online associate degree in health information technology or a bachelor's in health information administration – both of which are offered by DSU. The health care coding program consists of 35-36 credits and provides the knowledge students need to be competitive for entry-level roles. 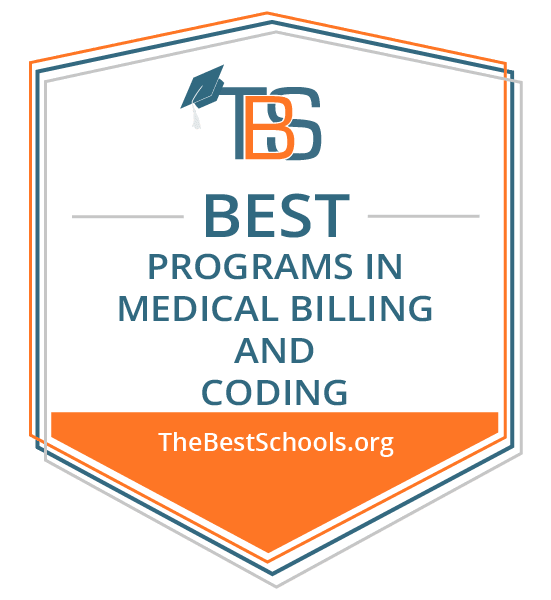 Medical billing and coding online courses are divided evenly between science classes (such as human anatomy and physiology) and computer classes (such as revenue cycle management and health care procedure coding systems) to provide a well-balanced program of study. All enrollees also complete a supervised practicum at an approved health care facility to gain hands-on training. Courses are provided asynchronously, and those who study full-time and take a summer class can finish all of their requirements within a year. To qualify for admission, applicants must have scored 18 on their ACT (or earned a composite SAT score of 870), have a cumulative GPA of at least 2.6, and be in the top 60% of their graduating class. Individuals without a high school diploma need a composite GED score of at least 2250. Barton Community College ranks #3 on The 25 Best Online Associate in Medical Billing & Coding Programs! Unlike more generalized programs, Barton Community College's online certificate in medical coding specifically focuses on the type of coding used in ambulatory care, doctor's offices, and clinics, providing more in-depth skills and knowledge. The program consists of 44 credits, and it typically takes full-time students three semesters to earn their degree. Part-time learners may need four semesters to finish all of the requirements. Although BCC is located in Grand Bend, Kansas, the distance-learning format of its medical billing and coding online certificate enables learners throughout the country to fulfill their educational goals. After reviewing the basics of human anatomy and physiology, students move into a sequenced coding structure that focuses on keyboard skills, medical administration, and legal/ethical issues within medical coding and billing. A student's final two hours are dedicated to a medical coding internship, which can be completed at an approved facility near their home. Unlike other schools that require students to possess a minimum GPA or a particular ACT/SAT score, Barton Community College uses an open-admissions policy. This means that the vast majority of learners who submit a completed application gain admittance into the program of their choice. Every admitted student pays the same low rate for for online classes, regardless of their state of residence. Barton Community College is regionally accredited by the Higher Learning Commission (HLC). Minnesota West Community and Technical College ranks #4 on The 25 Best Online Associate in Medical Billing & Coding Programs! In addition to campuses in the cities of Pipestone, Canby, Granite Falls, Jackson, and Worthington, Minnesota West Community and Technical College also has a thriving distance-learning program. This includes its online medical coding specialist diploma, which is best-suited for individuals seeking to kickstart careers in the health care industry. Recognizing the demand for these trained professionals, MWCTC also offers a medical secretary diploma and an associate degree for learners who want to pursue additional education. The certificate requires students to complete just 34 hours of coursework, enabling dedicated, full-time learners to finish the program in just two semesters. Alternatively, part-time students typically need three semesters to graduate. Although brief, the curriculum provides broad exposure to the skills and knowledge graduates will encounter on a daily basis in their future careers. In addition to covering topics such as medical insurance, reimbursement, and microcomputers, students receive a crash course in body structure and function, health care and society, and disease conditions. Prospective enrollees looking to obtain a firsthand look at the program can take an online video tour. Tuition and fees are the same for all students, regardless of their state of residency. Additionally, individuals aged 62 or older can enroll for reduced tuition if they reside in Minnesota. To be considered for admission, applicants must submit copies of their GED or high school diploma and transcripts. They must also apply for financial aid. Peirce College ranks #5 on The 25 Best Online Associate in Medical Billing & Coding Programs! Students pursuing medical coding certification online from Peirce College learn the ICD-10 coding system, which prepares them to work with thousands of codes in use today. In addition to completing medical coding training online, distance learners become well-versed in the areas of physiology, medical terminology, and health delivery systems. Although many students attend class on Peirce's main campus in Philadelphia, learners also have the option to study fully online or enroll in a hybrid program that combines both campus-based and distance learning. Upon graduation, students can sit for the AHIMA Certified Coding Specialist examination. Students can also opt to continue their education and earn an associate in science in health information technology or a bachelor's of science in health information administration at Peirce. This certificate requires students to complete 40 credits, including a medical coding professional practice experience that exposes them to real-world work scenarios. Founded in 1865 to serve returning soldiers, Peirce College has a long history of educating adults and nontraditional students; the school endeavors to provide increased flexibility to help these individuals balance other responsibilities with their schoolwork. All classes are available asynchronously, and students can listen to lectures and turn in assignments at their convenience. As a private school, all enrollees pay the same tuition, regardless of where they live. Charter Oak State College ranks #6 on The 25 Best Online Associate in Medical Billing & Coding Programs! Distance learners seeking an accelerated online medical billing and coding school certificate may be interested in attending Connecticut's Charter Oak State College. Made up of just 21 credits, motivated learners can earn this certificate in less than a year. However, although it takes less time than other programs, individuals who earn COSC's certificate can still sit for credentials provided by the AHIMA or American Academy of Professional Coders. Coursework covers standard topics, such as pathophysiology and medical terminology, while also digging into reimbursement methodologies and advanced medical coding and billing. This certificate does not include an internship or practicum component, but learners can choose to arrange their own experiential learning opportunities during the program. Grades of “C” or higher must be earned in each certificate course. Although many students use this certification to pursue work immediately after they graduate, some opt to continue their education to improve their earning potential. In this case, COSC also has an online bachelor's in health information technology. Out-of-state learners pay more per credit hour than in-state residents, but tuition remains relatively inexpensive compared to most private colleges or universities. Additionally, the program's accelerated timeline helps keep costs low. To be considered for this program, applicants must have already completed nine college-level credits at an accredited college or university. Charter Oak State College is regionally accredited by the Higher Learning Commission (HLC). Wisconsin Indianhead Technical College ranks #7 on The 25 Best Online Associate in Medical Billing & Coding Programs! The medical coding specialist technical diploma offered by Wisconsin Indianhead Technical College consists of 28 credits. Full-time learners typically complete the program in about one year. Developed to prepare future medical coding professionals for entry-level roles, the curriculum teaches enrollees about the everyday language of physicians and other health professionals as well as coding language. Offered entirely online through asynchronous classes, WITC students can begin classes on several start dates throughout the year. During their first semester, students learn about both coding and the health care system as a whole, completing courses in CD and CPT/HCPCS codes alongside human disease and health care reimbursement. Because many students in this program end up continuing their education after earning this diploma, all of the required courses also count toward the first year of WITC's health information technology associate degree; this is also offered online. Additionally, the school hosts a medical administrative professional bachelor's degree program. Students pursuing this diploma pay a flat tuition, regardless of where they live. Distance learners are also eligible for financial aid. When applying for admission, students follow a simple three-step process that includes filling out and submitting an online application, completing an assessment, and attending a virtual meeting with a WITC admissions counselor. To be eligible, students must have a high school diploma (with a GPA of at least 2.0) or a GED. They must also have completed either one year of high school chemistry or one semester of college chemistry. Wisconsin Indianhead Technical College is regionally accredited by the Higher Learning Commission (HLC). Alexandria Technical & Community College ranks #8 on The 25 Best Online Associate in Medical Billing & Coding Programs! As a member of the Minnesota State University system, online medical coding specialist students at Alexandria Technical and Community College receive support from an established educational system. The curriculum consists of 45 hours and is broken down into four semesters where students complete 10-12 hours each term. Coursework teaches students about a variety of topics, ranging from pathology and pharmacology to ICD coding and health care systems and practices. During their third semester, all medical coding learners take a one-hour job seeking and keeping skills class to help prepare them for life after college. To be admitted into ATCC's accredited online medical billing and coding program, students must demonstrate self-sufficiency, organization, and time management. The most competitive students have already completed courses in the areas of business, biology, chemistry, and/or health. Every student must have also taken an intro to computers class (or the equivalent). This competitive program is recognized by the National Healthcareer Association. ATCC works to ensure that every student, no matter where they live in the United States, has equal access to educational opportunities. To work toward this goal, all learners pay the same per-credit rate, regardless of their state of residence. Distance learners can apply for a variety of school-wide and degree-specific scholarships to help decrease their out-of-pocket expenses. Alexandria Technical & Community College is regionally accredited by the Higher Learning Commission (HLC). Montana State University - Billings ranks #9 on The 25 Best Online Associate in Medical Billing & Coding Programs! Montana State University at Billings offers an online certificate of applied science in medical coding and insurance billing. Learners from across the nation have completed this 31-credit program, and most finish within one year. Once accepted, students follow a course of study that includes traditional medical coding and billing coursework, such as advanced medical coding and medical office procedures, while also investigating other topics like business mathematics and introduction to business writing. Distance learners gain the skills needed to analyze health records and assign the appropriate code to each diagnosis. They also build up their knowledge related to medical terminology, anatomy, and disease processes. Graduates can find entry-level work at hospitals, clinics, physician offices, extended care facilities, and medical insurance companies. Out-state-learners pay more than Montana residents, although students who live in states that belong to the Western Undergraduate Exchange receive a significant discount. According to 2016 MSU Billings graduate data, 100% of graduates from the program found employment in the field. Additionally, the median loan debt incurred by students who completed this program is less than $7,000. To be considered for enrollment, applicants provide a completed application, transcripts, and their GED scores or high school diploma. They must also hold a passing grade on MSUB's Accuplacer exam, which tests for elementary algebra and reading comprehension abilities. Montana State University is regionally accredited by the Northwest Commission on Colleges and Universities (NWCCU). Collin County Community College District ranks #10 on The 25 Best Online Associate in Medical Billing & Coding Programs! Located northeast of Dallas and boasting an impressive student body of 53,000 learners, Collin College had made a name for itself in the realm of distance education. Its medical coding certification online program is especially popular. Comprised of a series of courses in medical coding, learners complete the program in two semesters (352 total hours of class time). They also pay the same tuition and fees, no matter where they live in the country. The first term includes foundational topics, such as medical terminology and basic anatomy, while the second term digs into computing in the medical office, HIPAA compliance, and more nuanced coding procedures. To pass the program, students must “attend” at least 90% of each online course. However, because many students who pursue online medical billing certificates have other work and/or family obligations, Collin College allows learners to complete their studies at their convenience; they do not need to login for set class times. Students can also submit assignments and complete tests/quizzes on their own schedule. Upon completion of all certificate requirements, graduates can sit for the American Academy of Professional Coders' Certified Professional Coder examination to boost their employment prospects and earning potential. The school also offers a separate online medical billing program. This series consists of six classes (216 total hours of class time) and teaches students to create and submit insurance claims, inform patients of their coverage, collect and post payments from patients and insurance companies, and maintain patient insurance files. CCCCD is regionally accredited by the Southern Association of Colleges and Schools Commission on Colleges (SACS). Minnesota State Community and Technical College ranks among The 25 Best Online Associate in Medical Billing & Coding Programs! Operating as a member of the Minnesota State University system, Minnesota State Community and Technical College is a thriving institution that currently teaches about 10,000 resident and distance learners. The online medical coding and insurance billing diploma at MSCTC is longer than most other certificate programs in this field, requiring students to complete 50 credits. This may be a good option for learners considering an associate or bachelor's degree who want to try a shorter course first to ensure that they enjoy the subject matter. Of the 50 credits, 47 relate specifically to the medical coding program; the final three credits consists of restricted electives. Example classes include medical language applications, outpatient coding, medical office career insight, and a review class to prepare graduates for the Certified Professional Coder Examination. Before being fully accepted to the program, students must complete an assessment to identify whether they need to take additional developmental classes in math, writing, and/or reading. If students need to take these courses, they do not count toward the 50 credits required to earn the diploma. Full-time students typically finish the program in four terms by taking 13-16 credits during two fall and one spring semesters and six credits over the summer. Additionally, differentiated courses of study are available to students seeking to enroll on a part-time basis. The school chargers resident and non-resident students the same rate. Minnesota State Community and Technical College is regionally accredited by the Higher Learning Commission (HLC). Drexel University ranks among The 25 Best Online Associate in Medical Billing & Coding Programs! As an early adopter of distance learning, Drexel University in Philadelphia is a leader in providing flexible programs that can be completed online. The university's accredited online medical billing and coding program awards a certificate and can be completed over the course of four, 10-week quarters. This program is well-suited for individuals seeking to enter the medical billing and coding field as well as for those currently working in hospitals, clinics, medical offices, or insurance organizations who want to brush up on their skills and improve their career opportunities. In the program's six required courses, students learn about CPT, HCPCS, ICD-9-CM, and ICD-10 – the four most frequently used coding manuals in the field of medical coding and billing. Rather than including additional biology-based classes, all of the required courses focus specifically on coding. Graduates can sit for national coding certification exams offered by the American Medical Billing Association, the AAPC, and the American Health Information Management Association. Additionally, if students decide to continue their education, most of the credits earned in this program can be applied towards Drexel's bachelor's degree in health services administration. To be admitted, students must have a high school diploma and submit their official transcripts. Because Drexel is a private university, all students pay the same tuition, regardless of where they live. North Dakota State College of Science ranks among The 25 Best Online Associate in Medical Billing & Coding Programs! Located in the small southeastern North Dakota city of Wahpeton, the North Dakota State College of Science offers an accredited online medical billing and coding program that full-time students can complete in 11 months. Prospective students must obtain a high school diploma or equivalent and submit an official ACT or placement testing results before enrolling. Enrolled students focus on topics including coding guidelines, insurance concepts, reimbursement, and payment systems, and complete all program requirements online. Learners must complete 41 credits, including a two-credit online capstone requirement. The virtual capstone practicum requires students to use encoder-grouper software to code a variety of actual health records. NDSCS requires full-time online students to complete 13 courses, plus the two-credit capstone, over two semesters. Required program courses include an introduction to health information, pathopharmacology, reimbursement methodologies, and computer applications in healthcare. Students must also complete basic and intermediate diagnosis coding, basic and intermediate procedure coding, and two anatomy and physiology courses. NDSCS also requires students to complete medical terminology, business use of computers, and a one-credit science of success course. Students must earn at least a C grade in all courses to advance through the program and take the practicum. Students must also type at last 40 words per minute and possess basic computer skills, including the ability to use email, upload and download files, install software, and search the internet. Upon successful completion, students earn certificates in health information with an emphasis in medical coding. Students may also opt to pursue a health information technician associate degree. The AHIMA Professional Certificate Approval Program approves the NDSCS program and sponsors an entry-level coding certification examination. North Dakota State College of Science is regionally accredited by the Higher Learning Commission (HLC). Sinclair Community College ranks among The 25 Best Online Associate in Medical Billing & Coding Programs! Sinclair Community College in Dayton, Ohio, offers a short-term technical certificate program that enables students to obtain a medical coding and billing specialist certificate in less than a year. To graduate, students must compete 23 credits offered through Sinclair's Health Information Management department in the college's health sciences division. Students may choose to complete all courses online, with the option to take a combination of online and classroom courses at Sinclair's Dayton campus. The online medical billing and coding program teaches students to assign the procedural and diagnostic code numbers that affect reimbursement for medical costs and services. Required courses include human anatomy and physiology I and II, introduction to healthcare delivery, fundamentals of disease processes, and medical terminology. Other required courses include drug classification for coding, medical billing specialist, and introductory and advanced medical office coding. Students must earn at least a C grade in every course and complete the program with at least a 2.0 grade point average to earn their certificates. Successful completion of the medical coding and billing specialist certificate program enables graduates to sit for the Certified Professional Coder – Apprentice (CPC-A) credentialing exam offered by the American Academy of Professional Coders. Holders of the CPC-A credential may work as apprentices, while continuing their educations and eventually taking the American Health Information Management Association's Certified Coding Specialist – Physician-based Exam. Prospective students may register for the certification program online. The Ohio Board of Regents approves the college's programs, and students may earn an associate degree, in addition to completing specialized certification courses. Sinclair Community College is regionally accredited by the Higher Learning Commission (HLC). Southwest Wisconsin Technical College ranks among The 25 Best Online Associate in Medical Billing & Coding Programs! Located in Fennimore, Southwest Wisconsin Technical College offers a medical billing and coding online certification course that students can complete in about 1.5 years. The three-semester program requires students to successfully complete either 32 or 33 credit hours while earning at least a C grade in every class and maintaining a 2.0 grade point average. During the first semester, students must complete a course in medical terminology and either a course in basic anatomy or general anatomy and physiology. Students will complete either six or seven credits during the first semester. During the second semester, students complete 14 more credit hours of studies. Courses include foundations of health information management, digital literacy for healthcare, and human diseases for the health professions. Students also complete courses in CPT coding and ICD diagnosis coding during the second semester. The final semester requires students to complete courses in intermediate coding, ICD procedure coding, health care reimbursement, healthcare law and ethics, and oral/interpersonal communication. Learners complete 12 credits during the third semester. Career opportunities for graduates include outpatient coder, inpatient coder, medical coding analyst, coding analyst, and claims analyst. Prior to enrolling, prospective students must submit proof of their high school diploma or equivalent, any college transcripts, or ACT or Compass scores. Southwest Wisconsin Technical College is regionally accredited by the Higher Learning Commission (HLC). Moraine Park Technical College ranks among The 25 Best Online Associate in Medical Billing & Coding Programs! Moraine Park Technical College in Fon du Lac, Wisconsin, enables students to complete a medical coding specialist technical diploma in just one year. The program teaches students how to collect health data, use software programs that enable data collection and medical coding, master coding and reimbursement systems, and utilize professional ethics and standards. Prospective students must submit high school and college transcripts, take a college assessment test, and complete the school's program orientation prior to enrolling in the medical coding specialist program. During the first semester, learners study medical terminology, ICD diagnosis coding, basic anatomy, and human diseases. The second semester teaches students about important topics such as healthcare digital literacy, foundations of health information management, CPT coding, ICD procedure coding, and healthcare reimbursement. Students must successfully complete an intermediate coding exit assessment to check off program requirements. Graduates pursue the 29-credit program over two semesters of studies, with all courses completed online. Those who want to continue their studies can use the credits earned toward an associate of applied science degree. Moraine Park does not charge out-of-state tuition rates for students located outside of Wisconsin and who enroll in the medical billing and coding online school program. The AHIMA allows graduates of the Moraine Park medical billing and coding online courses to take the national clinical coding associate certification exam. After two years of relevant work, program graduates qualify to take AHIMA's national clinical coding specialist examination. Many go on to work as medical coding specialists in hospitals, surgery centers, long-term care facilities, and similar health care facilities. Moraine Park Technical College is regionally accredited by the Higher Learning Commission (HLC). Cowley County Community College ranks among The 25 Best Online Associate in Medical Billing & Coding Programs! Cowley County Community College in Arkansas City, Kansas, offers students the option of obtaining a medical coding certificate or a two-year medical coding associate degree. Graduates may take the AHIMA certified coding associate or certified professional coder exams. The medical coder certificate program requires students to complete 35 credit hours of courses over two semesters. Students seeking an associate degree must complete the 35 credits in the certificate program, plus 30 credit hours of general studies. The core medical billing courses the program teaches include pharmacology, medical terminology, anatomy and physiology, pathophysiology, and legal and ethical issues in health care. Other core courses teach students an introduction to health information, CPT coding, bioethics, reimbursement methodology, international classification of disease coding, and health care coding. Students can complete all medical coding classes online, but have the option to opt to take some courses in the classroom. Students may transfer credits earned into either an associate degree program or transfer them into a bachelor's degree program elsewhere. Cowley College administers an open enrollment for the medical coding certificate and associate degree programs. Prior to enrolling, students must complete a basic assessment test to determine they have the proper educational background to succeed. The college may require some students to complete basic skills or prerequisite courses prior to entering either medical coding program. Cowley College offers some scholarships (as well as financial aid) for students enrolled in the medical coding program. Cowley Community College is regionally accredited by the Higher Learning Commission (HLC). Columbus State Community College ranks among The 25 Best Online Associate in Medical Billing & Coding Programs! Columbus State Community College in Columbus, Ohio, provides medical coding training online that students can finish without setting foot inside a classroom. The college allows students to take a combination of online and classroom courses, but the medical coding certification program does not require classroom instruction. Prospective students must provide a copy of their high school diplomas or equivalents and possess basic typing and computing skills to complete program requirements. Students must earn at least a C grade in all courses and maintain at least a 2.0 grade point average to complete the program. Learners must also complete beginning composition and either an elementary statistics or quantitative literacy courses prior to admission into the three-semester medical coding program. The program requires enrollees to complete 22 credits hours of studies, which full-time students can manage in about a year. Core classes include three professional coding courses, pharmacology, medical reimbursement, and human anatomy, among others. Graduates complete a one-credit practicum to learn field skills. Students can complete the practicum online. Graduates may transfer credits into an associate degree program or a bachelor's degree program at a four-year college or university. Prior to enrolling in a degree or certification program, Columbus State College requires applicants to submit to a criminal background check, provide fingerprints, and complete a drug test. Columbus State Community College is regionally accredited by the Higher Learning Commission (HLC). Central Texas College ranks among The 25 Best Online Associate in Medical Billing & Coding Programs! CTC offers its certification and associate degree programs to active military personnel stationed anywhere in the world, so long as they have reliable internet access. Students can complete all course requirements online, but can also choose to attend traditional classroom courses in more than 150 locations. Core courses CTC teaches include medical terminology I and II, medical software applications, health data content and structure, coding and classification systems, and human disease/pathophysiology. Students also learn pharmacology, intermediate medical coding, coding and reimbursement methodologies, medical insurance, medical records technology, and other related courses. CTC requires all students to complete a one-credit internship to gain field experience and complete their respective programs. Students who wish to pursue an associate or bachelor's degree may transfer credits earned through the online medical billing and coding school. Central Texas College also offers a medical coding associate degree program that students can complete online. Graduates may take the AHIMA certificate coding associate exam and the American Academy of Professional Coders certified professional coder exam. Central Texas College does not require any prerequisite courses to enroll in the medical billing and coding certification or associate degree programs. Great Basin College ranks among The 25 Best Online Associate in Medical Billing & Coding Programs! Great Basin College in Elko, Nevada, provides one of the quickest certification programs of all medical billing and coding schools online. Each fall, students start the program and complete it before the start of summer. They complete 17 credits during the first semester and another 17 during the final semester. Students must take all courses in the sequence provided and complete the program over two consecutive semesters. The program at Great Basin teaches students how to use medical terms, complete common health insurance forms, learn claims processing for reimbursements, how to find service codes, and other critically important billing and coding tasks. Students must earn at least a C grade in all classes, and maintain at least a 2.0 grade point average to satisfy program requirements. Great Basin employs a module format to teach courses in medical billing and coding, medical terminology, health care structure and medical record content, and anatomy, pathophysiology, disease processes and pharmacology during the first semester. The second semester requires classes in diagnostic coding, reimbursement and procedural coding, outpatient coding, and English. Students must also successfully complete a coding practicum during the final semester. The AAPC and AHIMA approve the program's coursework and allow graduates to take the certified professional coder and certified coding associate exams upon completing program requirements. Graduates can also sit for the certified professional coder-hospital and certified coding specialists exams, but AHIMA suggests graduates work as coders for two years before attempting either exam. Great Basin College is regionally accredited by the Northwest Commission on Colleges and Universities (NWCCU). Dakota College at Bottineau ranks among The 25 Best Online Associate in Medical Billing & Coding Programs! Dakota College at Bottineau in North Dakota offers a one-year medical coding diploma that enables licensed graduates to code people's medical information for reimbursement to healthcare services providers. Dakota College only requires that students hold requisite keyboarding and typing skills prior to enrollment, and students can complete all courses online. Students must use Microsoft-compatible computers to run program software. Students learn the fundamentals of medical coding training online by completing 34 semester credits. Dakota College teaches all classes during the fall and spring semesters, and offers others on a limited basis during the summer semester. Core classes include basic procedure coding, basic diagnostic coding, intermediate coding I and II, and introduction to pharmacology. The program also teaches healthcare law and ethics, human structure and function, human relations in organizations, medical disorders, medical terminology, and computer applications in healthcare. Program graduates earn a medical coding diploma, which enables them to take North Dakota's licensure exam for certified professional coders. Many graduates find work in the health information field, including positions at hospitals, medical offices, insurance companies, and other healthcare-related jobs. Students attending other accredited colleges or programs may qualifying transfer credits toward the medical coding diploma. Students can also transfer their credits toward an associate degree or bachelor's degree at a four-year college or university. Graduates must maintain at least a 2.0 grade point average to earn a medical coding diploma. Dakota College is regionally accredited by the Higher Learning Commission (HLC). Gogebic Community College ranks among The 25 Best Online Associate in Medical Billing & Coding Programs! Gogebic Community College in Ironwood, Michigan, offers a medical coding and billing specialist certificate that graduates can complete in two years. The program requires full-time students to complete 42 credit hours over four semesters, but students can take longer to finish their studies. Students can complete all courses online, but have the option of attending classes in person. Gogebic offers one of the most comprehensive medical coding programs online. Students learn health information management, anatomy and physiology, medical terminology, medical office procedures, disease process and pharmacology, and health care data structures, among other courses. Students must also complete a two-credit internship to gain field experience and satisfy all program requirements. Students must maintain at least a 2.0 grade point average and earn at least a C grade in every course to successfully complete program requirements. Graduates qualify to take a national examination to become licensed. Enrollment requires prospective students to submit copies of their high school diplomas or equivalents. Gogebic requires students to possess sufficient typing and computer skills, plus high-speed internet access. Many also apply for and receive financial aid from federal, state and other sources while enrolled in the medical coding and billing specialist program. Graduates typically pursue positions at medical clinics, hospitals, long-term care facilities, and for health insurance companies. Gogebic Community College is regionally accredited by the Higher Learning Commission (HLC). Everett Community College ranks among The 25 Best Online Associate in Medical Billing & Coding Programs! Located in Everett, Washington, Everett Community College offers one of the most advanced medical billing and coding schools online. The college offers a medical coding certificate that students can complete in about two years after completing 44 credit hours of study, including a practicum. Program graduates qualify to take the certified professional coder-apprentice exam. The medical coding program prepares students to gain entry-level jobs as professional coders after passing required licensing exams. Students learn healthcare, disease processes, and medical treatments, while learning the proper codes for each to ensure service providers receive reimbursement for providing healthcare. The American Association of Professional Coders enables program graduates who successfully complete the program's capstone practicum to perform a one-year apprenticeship -- instead of two years -- to take the certified professional coder exam. AHIMA certifies and approves the medical billing and coding program at ECC. Graduates may attempt the AHIMA certified coding associate test after completing program requirements. Prospective students must obtain a high school diploma or equivalent and possess sufficient computer skills to enroll in the medical coding program. Students complete the 44 credits at their own pace and the program makes all courses available online. Students must earn at least a C grade in every course and maintain at least a 2.0 grade point average to complete the coursework. Students may transfer credits into the program, while program graduates may transfer credits earned toward an associate degree or a bachelor's degree program at another school. ECC offers financial aid for qualifying students. Everett Community College is regionally accredited by the Northwest Commission on Colleges and Universities (NWCCU). Fisher College ranks among The 25 Best Online Associate in Medical Billing & Coding Programs! The program requires graduates to complete 37 credit hours of studies while maintaining at least a 2.0 grade point average. Students must also earn at least a C grade in every course they complete. Fisher's program includes coding and classification systems I, II, III, and IV, medical coding professional practice, and an introduction to health information technology. The program also covers topics such as computer applications, healthcare reimbursement methodologies, pharmacology, anatomy and physiology, and the study of disease. All credits earned apply toward an associate in health information technology and many degree programs at four-year colleges and universities. Students can also earn credits by examinations by taking and advanced placement exam or by completing the College Level Examination Program. Fisher also offers bachelor's degrees, and credits earned through the medical coding program can apply toward one. AHIMA approves the medical coding program's courses and allows graduates to take the certified coding associate exam. After acquiring work experience, graduates eventually can attempt AHIMA's certified coding specialist exam. Fisher College is regionally accredited by the New England Association of Schools and Colleges (NEASC-CIHE). Midland College ranks among The 25 Best Online Associate in Medical Billing & Coding Programs! Midland College in Midland, Texas, provides medical coding certification online that students can complete in a year after satisfying prerequisites. Before enrolling in Midland College's coding and billing certificate program, students must complete courses in business computer applications, medical terminology, and human anatomy and physiology. Those courses total 10 credits, and students must earn at least a C grade in each. After satisfying all prerequisites, students can enroll in the coding program (which requires completion of another 25 credits over two semesters). The first semester covers coding and classification systems, ambulatory coding, legal and ethical aspects of health information management, and documentation for medical practices. Those courses total 12 credits. The final semester covers health information systems, coding and reimbursement methodologies, advanced medical billing and reimbursement, and pathophysiology. Students also complete a one-credit practicum that provides workplace training. The final semester totals 13 credits, including the practicum. Students can complete all course requirements online, but can also opt to take some classes at the Midland College campus and off-campus learning sites. Learners who need financial aid may file for federal student loans and other assistance, including scholarships and work-study programs. Graduates of the medical coding and billing certificate program qualify to take AHIMA's certified coding associate exam. Program graduates can also transfer credits earned into a program for an associate degree or bachelor's degree at Midland College or elsewhere. Midland College is regionally accredited by the Southern Association of Colleges and Schools Commission on Colleges (SACS). After taking medical billing and coding online courses and earning an associate degree, many students pursue a bachelor's degree, which results in increased earning potential and advanced education opportunities. According to PayScale, bachelor's degree holders earn significantly higher salaries than professionals with only an associate degree. Plus, professionals with higher degrees have more career options. Below are a few degree options for students interested in medical billing and coding. Bachelor's of science in clinical laboratory science: This degree is ideal for aspiring clinical laboratory science professionals. Medical laboratory technologists help doctors determine effective treatment options by studying the presence or absence of disease. This type of program includes a clinical internship, during which students conduct research, evaluate and interpret results, and develop new test methods. Bachelor's of science in healthcare administration: Graduates with this degree run daily operations of healthcare organizations. Coursework explores the political, social, and economic components of health services, and students gain strong project management and leadership skills. Bachelor's of science in health information management: Students learn to analyze and protect the confidentiality and security of medical information. Learners explore innovative information management technology, information policy, finance, and data management. Medical billing and coding online courses include human anatomy, health services, and procedural terminology. Online students gain skills through virtual simulations, videos, 3D representations, and group discussion boards. Specific coursework varies by school, but the courses listed below are common to most medical billing and coding programs. Pathology and pharmacology: Learners study human illnesses and their corresponding drug therapies and treatments. Topics include disease processes, symptoms, diagnostic measures, pharmaceuticals, and dosage. Human anatomy and physiology: Students learn about the structure of the human body, including major systems and functions. Online students utilize virtual lab work and simulation activities to understand topics such as cell structure and muscular systems. Medical terminology: An understanding of medical terminology is crucial for any medical coding and billing professional. This course covers medical terms related to areas such as systems and organs, major pathological conditions, and pharmaceuticals. Certification is an optional credential that requires candidates to pass an exam administered by a professional organization. Earning certification demonstrates commitment to the field and separates job seekers from the competition. While an associate degree in medical billing and coding is recommended to sit for the certification exams below, it is not required. Certified Professional Coder: To sit for the CPC exam, candidates must have two years of medical coding experience and extensive knowledge of all code sets. The exam costs $380 -- or $300 for AAPC students -- with one free retake. This certification is common for medical coders who work in physicians' offices. Certified Outpatient Coding: The COC exam is designed for individuals pursuing outpatient ambulatory coder careers, such as positions in ambulatory surgical centers or hospital outpatient billing and coding departments. The exam costs $380 -- or $300 for AAPC students -- with one free retake. Prerequisites include two years of medical coding experience. Certified Professional Coder-Payer: Candidates for the CPC-P credential must be proficient in coding guidelines and reimbursement methodologies. Claims reviewers, auditors, and benefits administrators often hold the CPC-P certification. However, the AAPC is not currently accepting new registrants for this exam. After earning an associate in medical billing and coding online, graduates become medical records and health information technicians, coders, and medical records clerks. These individuals ensure the quality, accuracy, and security of health-related data and work in a variety of healthcare settings, including hospitals, medical clinics, and doctors' offices. Medical records and health information technicians: These technicians work with registered nurses and other healthcare professionals to ensure the accuracy and security of data such as patient medical histories, test results, and treatment records. They use classification systems to code and categorize data and electronic health records. Health information clerks: Health information clerks maintain patient records, prepare reports, and perform office support functions in health-related settings. They work in hospitals, clinics, and doctors' offices. Medical transcriptionists: Also known as healthcare documentation specialists, medical transcriptionists prepare healthcare and medical documents, such as medical histories and discharge summaries, by listening to audio recordings from doctors and other healthcare professionals. They often use speech recognition technology.